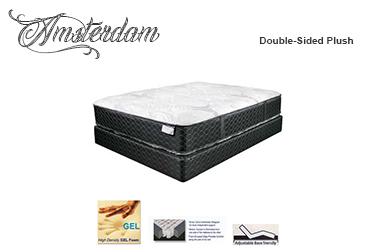 The "Amsterdam Double-Sided Plush" is a soft-to-medium mattress with a two-sided design, a high coil count and a gel foam layer on each side. This is a mid-priced mattress model with premium features and it's made in the USA. Having the ability to flip a mattress over can add to the amount of time for which it still feels as it did on the showroom floor. It will likely add to how long your mattress lasts, as well. A higher profile pocketed coil is also usually more durable than a standard-height coil. So, despite it having a softer feel, Symbol has designed this mattress very much around longevity. The perimeter support comes from a foam encasemement. The cover of this model is made with the state-of-the-art Tencel material, which is stronger than traditional mattress cover fibers. It's also designed with 'Tac & Jump' style quilting, which provides the 'puff' that you can sort-of fall into, before you drift off to sleep. All foams used in the making of this mattress are CertiPUR-US certified - meaning, they are non-toxic have little-to-no offgassing. 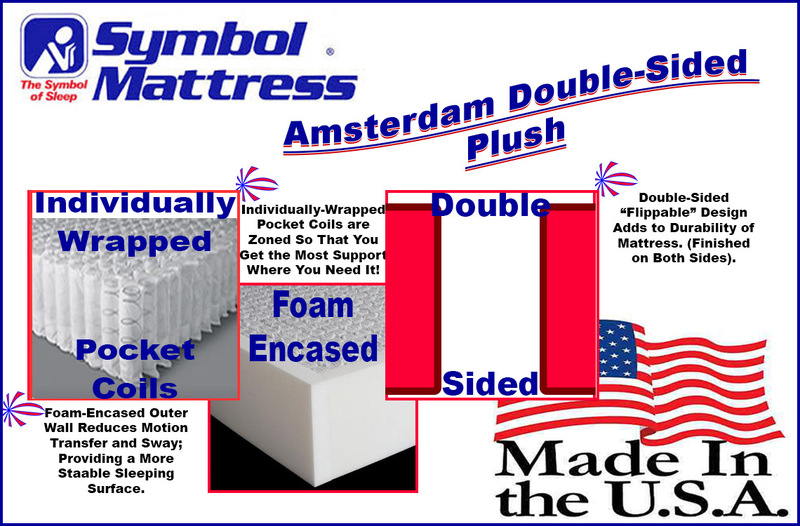 The "Amsterdam Double-Sided Plush" is a high-quality/moderately priced mattress produced in the United States by Symbol Mattress. It's a medium-soft (plush) feel, with a gel layer to help with heat dissipation and zoned pocket coils for optimal support. The "flippable" design helps add durability to this mattress and is a design feature that's not as common as it once was. The high coil count and foam encased edges provide not only a stronger edge but also a more stable sleeping surface. By many other makers, this would be a very costly mattress model. Symbol has managed to provide yet another mattress with luxury features, for a moderate price point.